Email inbox gimmicks keep popping up. First Google introduced Priority Inbox, and now it’s using category tabs. Dropbox purchased Mailbox, which turns your inbox into more of a to-do-list. Microsoft’s Outlook.com has a Sweep feature that automatically cleans your inbox. All of these are attempts to manage your email inbox for you. These gimmicks are never as smart as you yourself are, so you can make your email much smarter by taking a more active role. We’ll be using Gmail here, but the principles should be similar for any email client. First, we’ll get rid of whatever gimmicky inbox Gmail is using today. These inboxes never get the categories and prioritization perfectly right. They force you to go through all your email to ensure you don’t miss anything and encourage you to keep getting spammy useless emails by sweeping them under the rug. To use a more classic inbox in Gmail, click the gear icon and select Settings. Click over to the Inbox tab, click the Inbox type box, and select Unread first. All the tabs and priority options will vanish. With tabbed categories and priorities disabled, all your email will be sorted into one big pile. All of those useless social-network notification emails and newsletters you don’t care about will be in your inbox along with your actual important emails. This is good — rather than just sweeping emails you don’t want to see under the rug, you should stop them from arriving completely. Consider the type of emails you don’t want to see. Common types of useless emails include Facebook and Google+ notifications, promotional emails, and newsletters you may have inadvertently signed up for. Whenever an email you don’t want to see arrives, open it and use the Unsubscribe link — you’ll generally find these at the very bottom of the email — to unsubscribe from the email and prevent it from arriving in the future. Sure, actually unsubscribing is a bit more work up-front, but it makes your email much more manageable in the long term. Whenever an email you don’t care about arrives, use the Unsubscribe link and immediately prevent future emails from arriving. Under US law (specifically, the CAN-SPAM Act), it’s actually illegal for a company to not provide an unsubscribe link in their emails so you can opt out of future emails. However, some companies either haven’t gotten the memo or don’t care. Rather than pursue legal action to get off their email lists, you can simply create a filter that sends all future emails from them to your trash, where you don’t have to see them. When dealing with such an email in Gmail, open it, click the More link, and select Filter messages like these. Tune your filter to block the emails — for example, if you never care about receiving other emails from that sender, you can filter based on their email address. Use your filter to send all such emails to the trash. Some emails are important to have, but you may not want to see them anyway. For example, online stores may send you a confirmation receipt every time you purchase something from them. It’s good to have such receipts just in case you need them, but if you frequently purchase products and never want to see such emails, you may want to prevent them from reaching your inbox in the first place. This applies to many different types of email — for example, PayPal sends you a “We’re transferring money to your bank” email each time you withdraw money. You may want this email for your records, but you may not want to see it in your inbox. If you automatically archive such emails as they come in, you can put this process on autopilot. Just open such an email, click the More button in Gmail, and select Filter messages like these. Tune your filter to encompass the emails you want to catch — probably based on the Subject, if it’s always the same. Tell Gmail to automatically archive the emails and mark them as read so they won’t bother you. 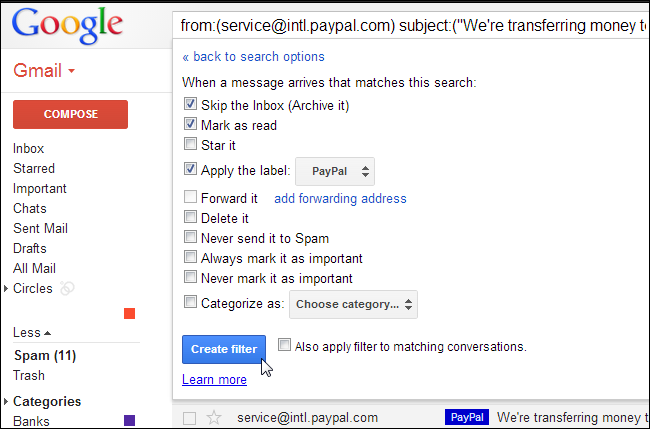 You can also have Gmail automatically apply a label to them, such as “Automatically Archived” or a more specific label. This will allow you to quickly find the emails in the future if you actually need them. If you’ve followed this process, you should have been able to cut down on the volume of incoming emails. Now we’ll help you sort the emails you do care about. This part is optional, but it can help if you receive a lot of email — particularly for different purposes. For example, you may have combined several Gmail accounts into one inbox and get all your personal and work emails in the same place. 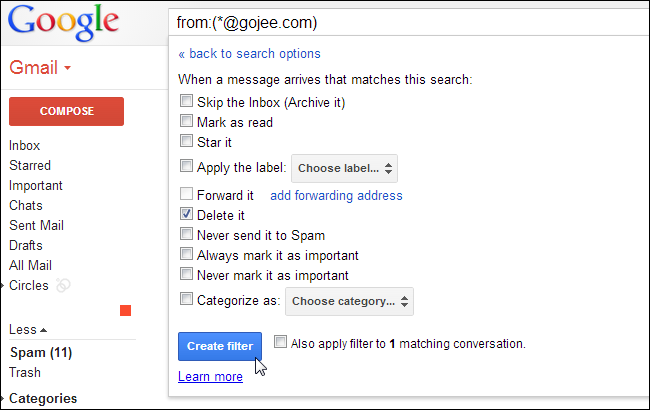 Try creating filters that automatically sort your incoming email into specific labels. 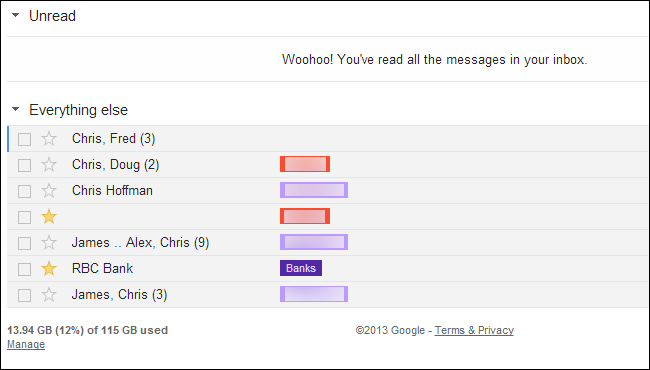 For example, you can have emails from your Bank automatically get a “Bank” label. You could have personal emails get a “Personal” label and work emails get a “Work” label. Receipts for purchased products could get a “Receipts” label. There’s no need to do this part manually — just set up Gmail so it will automatically sort your email into categories for you. Color-code all these labels and you can have your email client automatically categorize your emails and show you at a glance where they’re from. 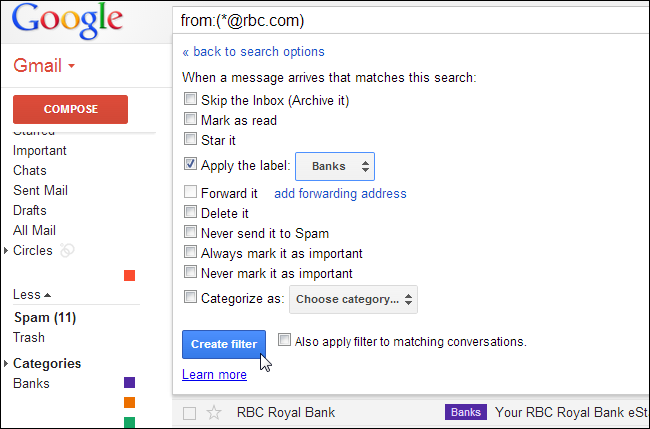 To color-code a label in Gmail, click its color box in the left pane and select a new color. With such a label system, you can even have the Gmail app on Android and email notifiers on other platforms notify you only when new messages arrive in important labels preventing notification overload. If there are certain emails that you want to be highlighted — perhaps emails from your boss or spouse — you could set up a filter to automatically star messages from that sender when they arrive. You can select a “Starred first” inbox type in your Gmail inbox settings, so such important emails would automatically rise to the top of your inbox. This would happen exactly according to how you configure Gmail — you wouldn’t have to fight with the inbox priority system and try to teach Gmail what’s actually important. This isn’t a set-it-and-forget-it process. Sure, after unsubscribing from email or setting up a filter, your email client will continue to take action on all incoming email — but there will always be new types of emails arriving. You’ll have to take action to unsubscribe and filter them properly, preventing your email inbox from becoming unorganized again. Email gimmicks try to automate this process — they try to automatically hide emails you don’t want to see, highlight what’s important, and categorize your email for you. But, with a bit more up-front work, you can set your email inbox to work exactly how you want it to, eliminating the need for all these gimmicks.